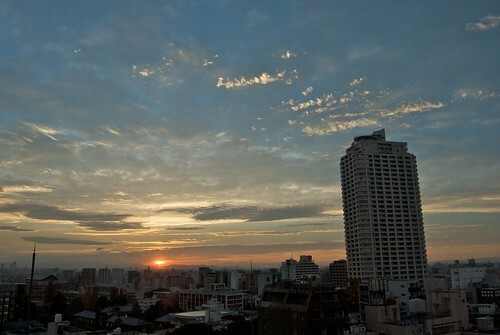 Last night was the first clear sky sunset I could catch since we moved in the new apartment in Ikebukuro. 梅雨 (the rainy season – literally rain like plums) is not over yet so it was a lucky day. I can’t wait until the typhoon season – after a typhoon, the skies are like washed from any cloud or fog – when I should be able to see the Fujisan clearly from my window. After a bit more than 1.5 years since moving to my current place in 志木, it’s time to move again. I’ve set my mind on a tower mansion 2 minutes from Ikebukuro station in Tokyo and should get the keys by the end of June. The view from the living room should be like the picture below on clear days (albeit from a lower vantage point but I should still be able to glimpse the Fujisan). Can’t wait to be doing cool Tokyo timelapses from my own window. And actually, I should count myself lucky, this is rather cheap and most of it is the deposit which I’ll mostly get back. Apartments here, especially new ones, often have a 礼金 which is also called key money and is a nice gift of 2 months of rent to the owner. Last Tuesday I went karting with some friends in Tokyo, around 北千住. The place is called City Kart, you can rent the course for ¥36.000/hour on weekdays with 5 200cc karts which I think is a pretty awesome pricetag considering the location. It is right next to the 京成関屋 train station or 10min walk from 北千住. More photos in the flickr set. Random shots I took lately while walking around Tokyo on the weekend with my trusty Nikon D60 50mm f/1.4. A skull chariot sculpture in Marunouchi. An abandoned ice-cream stand-sign in Koenji. Last Saturday morning I was leaving a party at 5 A.M. in Shibuya and decided it would be nice to come back home to Shiki with the new Tokyo Metro Fukutoshin line which was opening the very day and interfaces with my usual Tobu Tojo line for an almost direct trip to and from Shibuya (I just have to hop from one side of the platform to another at Wakoushi) in a breeze. So my girlfriend and I arrived at 5:30 after being guided by cops that were all over the station for the opening and got there to climb in the first train to arrive at Shibuya station and reversing for the journey back to Saitama. Remembering this saying by a good friend of mine, I wasn’t surprised when that first train came in Shibuya station packed full of weirdos with backpacks and cameras (the classic Otaku costume). They came out of the train clapping and cheering, taking photos of each other in front of the driving cabin and macroing on every little details of the new train and station. I didn’t take any photos of them as my girlfriend was afraid I would get shanked by one of the weirdos like what happened in Akihabara 2 weeks ago, but I do have some photos of the brand new piece of station in Shibuya. I’m not sure if they have Cribs on MTV Japan, but this guy would have a spot on the show for sure. From left to right: a Maserati Quattroporte, a Lamborghini Gallardo and an unknown Ferrari… More pics here and here. Posted on April 27, 2008 April 27, 2008 Categories japan, photos, RandomTags car, japan, photos, tokyo3 Comments on Welcome to my crib! 3rd year in Japan and each year I was on a busines trip somewhere for early April: the time of the 花見 parties. This time I was home and got to drink myself silly on a tarp under the cherry blossoms. On the border of the 目黒川, I got to take some nice photos with the president of the 写真倶楽部. Check out their website for more of the same and even a making-of. Walked around 表参道 yesterday visiting interior design shops, looking for cool lamps. The brand new MoMA store in the Gyre building (from which I took the photo) with lots of funny gadgets. hhstyle just down the road from there with very very nice and very very expensive furniture. First we went for drinks and dinner at her favorite restaurant: T.Y. Harbor Brewery in 天王洲アイル. It’s a Californian cuisine restaurant in a sort of hangar (not the old crummy ones, the cool ones that they transform in loft apartments and hype designer offices) right on the canals of Shinagawa. The place also brews it’s own beer in big vats behind the bar. Dinner is a bit expensive at 5-8,000￥ per person but the food is really delicious and the portions are big. Then we headed to our hotel: the Park Hotel Tokyo in 汐留メディアタワー. I had booked a room with a special plan guaranteeing a window facing straight on the Tokyo Tower. We had a little scare as we came in the room at 12:05am and as I opened the curtains I couldn’t find the tower: they had turned off the lights! I was really pissed… As my girlfriend had forgotten some cosmectics at home, we headed down to the combini at B2 level and as we came back we had the good surprise to see the Tokyo Tower had been lit back on. I took some cool shots of the view, check them out on my flickr page. Last week I took a day off work to go apply for my visa renewal in Shinagawa (hoping for 3 years this time). I love spending, every year, 2 1/2 hours listening to kids shout and cry, waiting for my number to come up, and 5 minutes of effective work with the immigration officer. WTF? I start telling her that she fucked up, it was moving before, she broke it. After making a big ruckus, the store manager comes out and I have to explain again with my broken japanese. The girl is almost crying, the guy finally understand what happened and start apologizing profusely. Apparently, the chick didn’t unserstand what I had asked her and thought I came because something was already wrong with the watch. He ended up calling all the Swatch stores in Tokyo to find me the same watch, but since it would take at least a week to get there, I finally chose a new one on the spot and left with it for free with all the staff bowing and seeing me out with a few dozen 申し訳ございません. Posted on July 29, 2007 July 29, 2007 Categories japan, Me, myself and ITags japan, swatch, tokyo4 Comments on You broke my watch! I went to see Sumo 2 weeks ago for the second time since I’m in Japan. This time around, I was sitting in the boxes on 1st floor (really just a tatami with 4 thin cushions) instead of far out in the poor people’s late gaijins’ cheaper seats on 2nd floor.